If there is one thing that I learn from the cult of Warren Buffett, it is that to be a good investor you have to read a lot. Well, I think we should read mainly on financial statements, and knowledge revolving the business that we are prospecting. However, we do not know what are the kind of companies that landed on our lap. They could seem like attractively priced companies but we are not familiar with it. The solution to this, is to read more in different areas so that, when they land on your lap, it might be something you encounter before. Reading, is also investing in your human capital. Penning your thoughts, is a mental practice of reflection, and also a proven way to remember things better. Weekly thoughts is my meditation. And if you are interested, my thoughts on certain wealth topics that I came across in the week, or interesting topics I came across. You will also find me explaining, or answering readers, ranting about stuff that gets me riled up. I try to be as unfiltered as possible. Can you earn 30%/yr writing options? I saw this discussion on Seedly and not sure where this was mention but eventually it did trigger a discussion whether it is possible to earn 30%/yr in options. You could break it up to 2.5% per month over 12 months. There are those kind of delta neutral options spread writing strategies like iron condor, iron butterfly, bull put spread, bear call spreads that allow you to earn an income monthly. These are probability based strategies, and can be passive. However, in reality I feel there needs to be a lot of adjustments sometimes. You are essentially laying out these strategies when volatility is high and shorting volatility. How much you earn monthly will depend on how far out versus the current strike price you wish to go. The further out, the lower the premiums, the lower your monthly return. However, the safer it is for these options you write to expire without the price being closed to the strike price. I have not done this in a long time, and I am not sure whether the structure has changed. If you write these kind of options, and wish to share your experience do comment below. Personally I think these strategies also have the chance of blowing up. Its just that volatility tends to be lower now. Think of it as… if you have $50,000 in capital and you are risking them to earn 1-3% monthly, hoping and adjusting your position so that it expires within a price range. The probability of it happening is 67% to 99%. However, if you expire in the money, or where strike is out of the range, you potentially lose all your $50,000. So the dynamics and psychology is a little different from your stocks and bond investment. I seen a question like how long or how do I reached $50,000 within 2 years or so. I have written quite a bit of articles on this but I would like to think from the angle of why the person ask this question. Is it because he or she has no idea the math behind? Or is it easier to ask somebody to help calculate that? I think if its the former I can understand. If its the latter, after a while, I wonder if I wish to continue to help. I do understand if you do not know how to go about because there are friends who are just not math inclined. Even if they are, sometimes it is not so straight forward. My suggestion is for folks to learn about the time value of money calculator. You can download one from the IOS or Android App Store or use an online one. A time value of money calculator gives you one variable when you key in the rest. 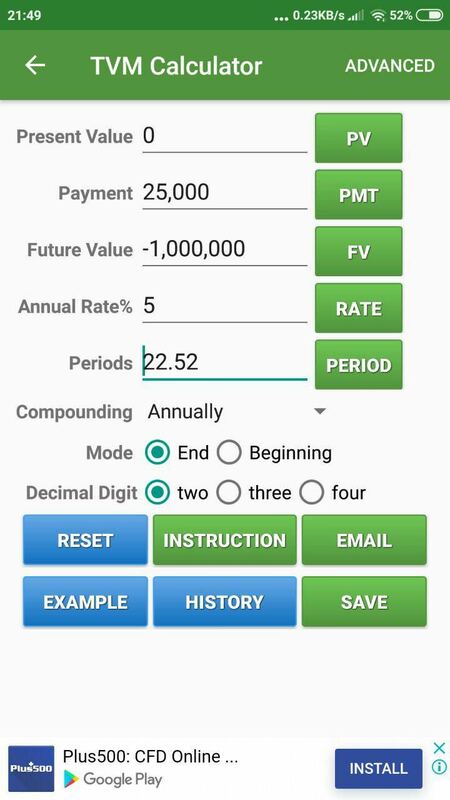 So for example the above shows if you put in a payment of 25,000 every year, and you want to accumulate $1 mil, your rate of return is 5%, if you pressed the Period button, you get 22.5 years. You can put in other permutations and you can come up with different figures. With this, you can vary things. For example, if you think 22.5 years is too long, you want to figure out how to increase your annual contribution so that it becomes faster. So you can change the Payment from 25,000 to 35,000 and see what you get for Periods. As a financial blogger with friends that talk these kind of stuff, we mess with this a fair bit. So if your friends want to get interested in what is the pot of gold at the end of the tunnel, you can play this with them. White Coat Investor has a good post on doctor shaming. I think it is a subject that if you are not a doctor, and perhaps a dentist you might not feel it. Then again the climate in Singapore might not feel the same thing. What he notice is that you have a group of doctors shaming other doctors who discussed or air their views that make them seem… profit driven. The idea for those criticizing them is that the medical profession should be about firstly doing good, or saving people. As medicine, dentistry and pharmacy are also very well remunerated profession, those criticizing feel that if you are in this profession you should not be very profit driven. The author’s point of view is that we have to understand that you cannot expect everyone to work for free. My take on this is that while medicine is a lucrative industry, it is also an industry that is not easy to get into, and requires some technical competency build up in graduate studies in order to get into. I wonder how many people think about this and only want to get into it because they can get rich (if you are in the industry you might want to provide a perspective here). I would like to think getting in might be a combination of prestige, family influence, monetary, altruism. Is F*** Y** Money going to Imprison or Free You? Chris Ng writes a thoughtful piece, reflecting after he watch Crazy Rich Asians. Particularly, he contrasts how old money, while in abundance didn’t free up the offspring in a rich dynasty but act as a prison. Old money is stifling. Nick Young was supposed to be married to his equal and be stuck in this milieu for the rest of his life. If you read all the books, Eleanor Young was a victim too. Until that pivotal Mahjong scene, all that money in the world cannot give Nick the freedom to be with who he loves. On the other hand, new money is free. Goh Wye Mun played by the hilarious Ken Jeong is much looser when upbringing his kids Peik Lin and PT. I have a special affinity with PT in the story because he seems to channel Singapore geek demographic. PT is also likely to turn INCEL in spite of all his wealth. I think it not just about rich family. Rich country, or large corporations get imprisoned when there are some sacrifice to be made so that the large entity can still move a long. Those that are in it, seldom have autonomy. Chris have this theory that people who decide to embarked on the FIRE path, might not eventually stick all the way to it. They will lose their motivation along the way. Perhaps this is due to folks having a plan B, tend to be less productive at work. If I understand it correctly, to be able to FIRE requires a certain criteria for your wealth to be able to cash flow without spending on your capital. He reasons, before they can reach the level of wealth that can conservatively cash flow without spending capital, they FIRE or do some schemes that deviates from a full FIRE. I don’t think this is true. Perhaps this is due to my journey. I have never reached a point where I felt comfortable I have accumulate enough because the numbers just kept going down, up , down, up. The markets are also volatile. You spend most of your time lowering your head and get to work on two fronts, the job and wealth building. In this scenario, how do you develop overconfidence that your wealth is going to cash flow well? I think a lot of people have the perception of that wealth machine model that if I have a portfolio that gives X% of dividend yield, as long as I do not spend the capital I am OK. This, in their opinion is a conservative model. That portfolio of dividend stocks, essentially, are still equities. And that means dividend income rise and fall, if you do not have enough, you have to sell part of your stocks to make up for the income. The stock itself can fall in value, and its not a given that it will come back. You have stocks like HPH Trust that just went down from IPO of 96 cents to 24 cents. If that is the core part of your portfolio, your dividend income goes down, your equity value goes down. Dividend stocks do not give it a special characteristic that it is more resilient. The nature of its business may give it characteristics that make it more resilient. How many millennial want a job that they can make an impact? Reddit had a problem hiring. A big problem. Their reputation was garbage after a string of CEO changes. Reddit, in a lot of ways grew out from tech people, and when it started become toxic, every engineer knows about this. It became a problem hiring. I like this story because I always am interested in seeing how do you turn a toxic environment around. Most of the time it does not worked out. Reddit today, while not redeemed, have started to make people forget there was an unhappy episode in the past. Kitces thinks we should increase the critieria to be an accredited investor instead of reducing the critiera so that only those people who have the ability, and the appetite to evaluate can touch these deals. This is because these deals, while have the potential for high reward, is also high risk. It does not mean that you have a lot of money or competent in making money from your work, that you are in a position to evaluation complex products. A lot of times, the criteria to be able to invest should be how well you are able to understand complex products. But given this that means a lot of trading products cannot be invested by average investors! This would kill many of them! As a financial blogger sometimes I wonder whether it is unassuring that I don’t think that this cryptocurrency is a bubble. Perhaps that gives you an idea how amateur of a finance person you are listening to (and perhaps you should change who you listen to!). I have experienced investor that immediately dismissed this as fraud/ponzi/bubble. Somehow, when this is meshed with technology, for an IT guy, I do not readily dismissed it. This article shares about how a property developer in UK felt when he sees his $120,000 becomes $500,000 at one point. Now from what I understand about the median income for UK, $120,000 is a lot of money! And it is sad as a person to see another lose so much of money, especially in a place where it might not be so easy to earn back (as compared to say a USA STEM engineer who makes $100,000/yr to $300,000/yr). And for me, I would classify him as the investor who is more cautious. Before he first invested, Russell spent years tracking bitcoin and studying blockchain, the technology underpinning digital currencies. He said the learning process was like solving the plot of a murder mystery. I wonder how many years is that. I know my friend Elvin Hayden Liang have been mining bitcoins since 2009 so that is at least near a decade away. You can’t say Russell are those that jumped into it without knowing anything. And this mirrors that for a lot newbie investors. They are cautious. And they take time to building up their competency before jumping in. Does that limit them from being killed? Not really. I know I said a lot that you need to know what you are buying, how does that strategy work, what are the downsides. In reality, you might have done the home work and still fail because not everyone of us will absorbed everything, understand everything and be able to execute by converting that knowledge and wisdom into great stock purchase at right prices. You also might be unlucky as well. This bit, serves more as a warning for active investors than just those that dabble in crypto currencies. Despite the loss, he remains a committed investor. People tend to hope that their losses will one day break even. This is listed in Prospect Theory. We tend to be more risk seeking with our losses. With our gains, we are afraid that our gains will be wiped off, so we tend to be more risk adverse. We tend to take them off. But stock markets tend to be more positive bias, so locking in gains often is the wrong move. I think it depends on markets. You definitely need some time for the investment to realize its narrative. Or to show a narrative that goes against your original narrative. So this means you shouldn’t just aim for 2-10% gain and then just pocket it. However, in some markets like Singapore, the businesses seldom have the capacity to just increase its share price, stagnates, goes down for a while, then go back up again. There tends to be hot money as well. In this climate, after the narrative or your investment scenario has worked out, taking profits make sound sense. In countries where we have seen companies compound, your analysis might show that you can purchase a company at a good value for its potential compounding ability. You can let it ride out longer, but constantly assess the business fundamentals against your investment thesis. How much money would you need to be given to quit and retire right now? Sometimes I come across some questions that I can answer in Quora. Here is a question on how much is required to quit and retire. My answer revolves around what I used to think is enough, how I derive that amount, and what do I think about that amount now. I got to know this when our fellow blogger Singvestor shared with his readers the major hiccup he faced when he was posted to Europe (he is actually working in Singapore for a long time but from a country in Europe). You can read more about it here. Singvestor, is an index exchange traded fund (ETF) investor. 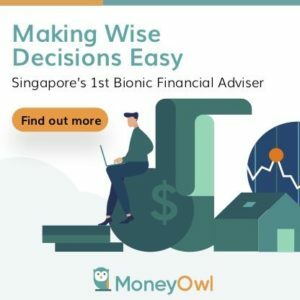 Specifically, he formed his portfolio by using local Singapore brokerages such as SCB, DBS, and UOB Kay Hian for example, to purchase broad market ETFs listed on London Stock Exchange on a recurring basis. Overnight, the local brokerages do not allow Europe based clients from purchasing these ETFs listed in Europe. DBS posted a warning message and ask customers not to buy non-UCITs ETFs, while Standard Chartered blocked him from buying anything whatsover via their online stock trading. PRIIPS stands for packaged retail investment and insurance products. It is aimed to increase the transparency and comparability of these insurance and retail investment products. It is aimed to protect consumers and under this regulation, the financial products have to comply with some regulations to clearly spell out risks, rewards and costs of different products. The European UCITS funds should be compliant or will be compliant with this, as with the MiFID II rules. However, somehow due to this well meaning regulations, local brokers do not wish to take this compliance risk and so decide not to allow those Europe based clients from trading through their platform. Personally I am still very surprised how this enforcement take place. It is as if the brokers can detect Singvestor is not in Singapore. This is perhaps through an IP and I wonder if he could just use a VPN and make it seem like he is purchasing in Singapore. So for now, he has to make use of European trading accounts. The issue is that you have to contend with another set of dividend withholding tax, capital gains tax issues. This will limit the kind of ETF he can buy to be efficient. I suppose he is the only prominent person affected so not sure how many of my readers that become expatriates in Europe, whether you guys are affected, so perhaps can share your experience. Here is a video interview by Dr Wealth with former Senior Correspondent Teh Hooi Ling. Ms Teh now runs Inclusif, a quantitative value fund, which raised $100 mil. That to me, is no mean feat consider that some ETF such as the first REIT ETF by Philips raised less than half of that if my memory serves me correct. Ms Teh shares that, there comes a time, after living a bond like life, you got to be a little risk seeking to grow. What I think is worthwhile to listen to, is the part where Alvin asked her for a fund that does not have a base fee, how do they survive a prolong downturn. So what she shares in summary is that 60% of the time, the market is up month. For the past 40 years, we haven’t seen a prolong sustain market decline for more than 2.5 years. If you cannot find stocks that you can buy, you should be selling. Don’t over pay. Don’t be too heavily concentrated. Back in the late 1990s, the world wide web started taking off. A lot of folks that are not tech savvy or nerds, started getting addicted to computers, and not playing games. It was an interesting phenomenon back then. Many of the friends in that industry started trying their hands on web hosting, hoping to start their own entrepreneurship. At 34, Alvin Poh Is A Multi-Millionaire. But He Doesn’t Think He’s Rich. I think not many did it as well as Alvin and his partner. Vodien became big. And when I had a problem finding a new home for InvestmentMoats.com, Vodien was one of the name that surfaced. 15 years after it was born the company was acquired by Australian online solutions provider Dreamscape Networks for $30 mil. So that effectively made Alvin, in our terms, financially independent if not abundant. Thus began Alvin’s quest to pick up any skill he could to improve himself – a point illustrated when he tells me that the following day, he has another lesson in plumbing at a course offered by ITE Simei. It is a great interview for a person who, despite coming into contact with such a large sum of money, remain a person with humility to give back to his alma mater and funds for deserving students.